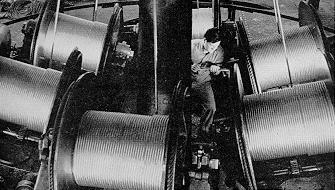 The production front: Wire rope machines work overtime at the Roebling factory in Trenton. The blackout lamp cast a violet glow over the living room. It was dark enough to ward off enemy bombers — but just bright enough for the Glover family to make out each other's faces as they huddled around a radio crackling with the latest war news. A shiver of fear and excitement went through 9-year-old Tom. This just in: German U-Boat spotted off the Jersey Shore in Ocean Grove! Nazi commando team reported landing on the beaches of Long Island! It was April 1942, and World War II had come home to 131 Hartley Ave., Hamilton. "Nazi saboteurs! Are they gonna come around here, Pop?" Tom Glover remembered asking. "Don't be silly," Mr. Glover answered, "What would a Nazi spy find out here in the sticks?" Young Tom Glover wasn't reassured. "I picked up my 'Boy Commandos' comic book and took a close look at the Nazis on the cover," he wrote in a later reminiscence. "They sure did look mean. They all seemed to be wearing a monocle, and each one had a menacing look on his face. I reached for my 'Captain Marvel' comic book. The cover showed a big picture of 'Captain Nazi.'" "So I guess Pop didn't know how bad these Nazis were. Oh, well, I couldn't blame him; he never read the comic books, so how could he know? Young Tom Glover may not have been that sophisticated about the nature of the Nazi threat, but he knew there was a war on. "Everybody was pulling together," said Glover, now 65 and an author on local history. "We were united, we all believed in God and country and we just wanted to win the war." Win the war. For four years, from 1941 to 1945, it was to be the single-minded purpose of the American home front — and Greater Trenton, with its manufacturing capacity, would be a key cog in the war machine. "Trenton Ready for War Action," read the headline in the Trenton Evening Times on Dec. 8, 1941, the day after Pearl Harbor. But if war readiness was in the air, so was panic and anti-Japanese hysteria. Two days after the attack, FBI agents in Trenton rounded up two Asian men as suspicious characters. They turned out to be Chinese laundrymen, and were set free. Would the enemy attack Trenton? No one wanted to take chances. From observation towers above Trenton's municipal reservoir and the hills around Harbourton, civil defense volunteers scanned the skies on 24-hour patrol. Everyone had to learn the air-raid signal: a two-minute blast from the firehouse siren, to be followed by an "all-clear" signal. Princeton's attempt at air raid drills, however, turned into a comedy of errors in January 1942. The sirens and klaxons being used to alert the populace turned out to be barely audible, prompting suggestions that church bells or even aerial bombs be used instead. And the aircraft spotters could barely tell an American transport plane from a German Messerschmidt. "One spotter, gazing intently at a star through the telescope, thought it increasingly resembled the shape of a dirigible," reported Princeton's civil defense chief, Wheaton J. Lane. The expected Axis air raids over the East Coast never materialized, but the menace from submarines was very real. Tankers sailing off the brightly lit Jersey Shore became sitting ducks for torpedoes, and dozens were torpedoed before the state Defense Council issued a general blackout order for coastal areas in March 1942. In April 1942 came the stunning news that young Tom Glover so vividly remembered — Nazi spies landed on Long Island, intending to burn down factories, only to get captured. Amid rampant suspicion, what to make of Master Sgt. Paul Hitler? That was the name of an Army military police officer who, beginning in the spring of 1942, made his office in the old Trenton High School on Hamilton Avenue. But he had no relation to Adolf Hitler, he explained to curious interviewers; he was, in fact, Brooklyn-born and Jewish. "I'm not changing my name," Sgt. Hitler told Time magazine. "Let the other fellow change his." While Trenton prepared to withstand an enemy assault that never came, it also steeled itself for shortages that became a fact of life when military needs took precedence over everything else. Tires were the first to be rationed, on Jan. 1, 1942; then gasoline, sugar, meats, butter. "Soap powder was the one thing I found hardest to get," recalled Adelaide Zelli Heller, now 74, who worked at the Roebling wire-rope plant. "One day, a rumor got started that the old American store on Tyler Street had soap. By the time I got there, there was already a line stretching around the corner." "But complain? You didn't complain. Everyone had a husband or a son in the service, and they were the ones risking their life, not you." Besides, civilians could enjoy a booming war economy as Trenton shook off the torpor of the Great Depression to become — for the first time since the 20s — an industrial powerhouse. All the city's big plants converted from civilian to military production: John A. Roebling's Sons; Thermoid Rubber; Crescent Wire; Philco; American Steel and Wire, Switlik Parachute. New companies sprang up, too: the naval turbine contractor, Delaval; several extensions of General Electric's Philadelphia plant, and dozens of chemical-makers. Unemployment simply vanished. In 1939 and 1940, George Bodine, then of Passaic Street, could only find work for $12 a week as a ticket-taker at the old Orpheum. When he went to Roebling to apply for a steel mill job, "They just laughed and pointed to the waiting list," he said. Then came Pearl Harbor. On Dec. 12, 1941, General Motors' Ternstedt Division in Ewing, which had been manufacturing car hinges, doorlocks and trim finish moldings, shut down for reconversion. It reopened a month later with a new name: Eastern Aircraft. Eastern Aircraft teamed with Grumman Aviation on a new product, a torpedo bomber to support the coming American counteroffensive in the Pacific. With Pearl Harbor still fresh in everyone's mind, the plane was given a fitting name: the Avenger. Suddenly, Bodine's labor was in demand — and now he was earning, not $12 a week, but $12 a day. He was assigned to a "crabbing crew," a group of troubleshooters who re-engineered deficient parts on finished aircraft. In November 1942, he was there as the first Avenger rolled off the assembly line. By war's end, 7,800 Ewing-made Avengers had been turned out. One of them was being flown by future Preisdent George Bush when he was downed over the Pacific in 1944. A Trenton-made Switlik parachute saved his life. "We worked 18 hours some day to turn out that plane, we didn't get off weekends, and we had no holidays," Bodine, now 75 and living in Hopewell, recalled. "We had a job to do ... and besides, we were making good money." In 1943, Bodine lost the draft deferment given him for working in a war plant — and he signed up in the Navy, hoping to fly the Avenger. He got his wish, and logged 200 missions over Eniwetok and Okinawa. As the war's insatiable demands dragged more men like Bodine went into the service, factories faced a manpower crunch. They solved it by hiring women. Women made up more than half the 8,000-strong work force at Roebling, Trenton's biggest industry. They prepared paperwork, cleaned floors, hauled steel and operated the machines that churned out steel airplane directional wires, assembly rods, radio antennae and anti-sub netting. All the while, they tried to scrounge up enough money to feed a family where the man of the house had left to fight a war. "Before 1941, Roebling had a policy where no single woman could work there," recalled Helen Borden, a secretary for Roebling's cost-accounting office. "Married women belonged in the home, not at work!" "But, of course, once the war started, they needed employees badly. I was 22 when I married my husband in 1942, and they wanted me to stay on. And then they began hiring more women." One of the new hires in 1942 was Pauline Pfleiderer, whose husband was serving in the Pacific as an airplane mechanic. While he repaired planes in Hawaii and Okinawa, she took to the Roebling mills every day to help build those planes. In coveralls and steel-toed shoes, Mrs. Pfleiderer fed metal bars into a machine that ground them into airplane connecting rods. Once, the young machine operator — all 120 pounds of her — began dragging a flat bucket filled with heavy iron scrap to another department. A supervisor dressed her down. "That's man's work! How are you going to be a woman if you keep doing that?" Yet she stayed on the job, treasuring her paycheck and, even more, her husband's letters from the Pacific. "In three years, I don't think a day went by without him writing me once," said Pfleiderer, now 77. "He wasn't allowed to say where he was, and it was maddening to not know. But he came home safe, which is all that mattered." Her job at the war plant, meanwhile, lasted right V-J Day, Aug. 14, 1945, when Japan finally sued for peace and the long, terrible war was finally over. "It was 6 or 7 at night and our boss came in," Pfleiderer said. "He said, 'Ladies, the war is over. Shut off all your machines quietly and go home.' I stayed a little longer because I was a foreman and I had to make sure everything was put away." "Well, I walked onto South Broad Street and the sight was amazing — cars bumper to bumper, horns going off, flags hanging out of windows, cheers. A regular parade. "It took me an hour or so, but I finally got home. I lived with my in-laws at the time, and we had saved up a little booze for a special occasion. "And my father-in-law drank a toast: to the end of the war. And that was V-J Day in Trenton."